Ten different musical groups are scheduled to perform on two separate stages beginning at 12 PM and concluding with a performance by the event’s headliner, The Gregg Welty Bluegrass Quartet at 8:30 PM. 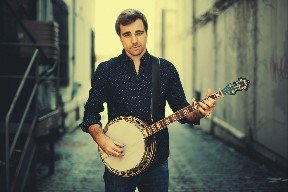 Gregg Welty is a legendary bluegrass banjo player, holding more distinct state banjo championship titles than any other banjo player. The talented musician’s 2018 bluegrass album, Community, is described as the largest collaborative bluegrass project ever, combining 50 different artists across 30 different studios. The energetic and humorously entertaining performer Baby Gramps will open for the Gregg Welty Bluegrass Quartet. Baby Gramps was named one of the top 50 most influential musicians of the past 100 years by Seattle Metropolitan Magazine. The long list of other musical performances includes Sean Clark and Friends, The Jeff Fetterman Blues Band, Tony Grey/Galactic Duo, Gem City Revival, Tyler Smilo, Brooke Surgener, Shoefly Soul and James Paolello. Several businesses will also be present during the event, offering demonstrations of musical equipment and providing workshops on subjects such as enhancing your band’s promotional kit, how to properly evaluate musical equipment before purchasing and how to incorporate an amp. These sponsors include Keystone Guitar, Lonelyman Productions, GH Plugs, Orange Amplifiers, Godin, Jackson, Seagull, Traynor Amplifiers, Hughes Kettner Amplifiers, Seymour Duncan and more! Tickets to the event are just $10 and may be purchased at pknpk.com. Overnight Accommodations as well as Group Condo Rentals are also available at pknpk.com or by phone at 1-866-377-5274. Established in 1964, Peek’n Peak Resort, in Clymer, NY, is a regional destination for golf and snow sports 30 minutes east of Erie, PA. The resort features a highly acclaimed golf course, 27 ski slopes and trails, 10 miles of cross country terrain, an exquisite day spa, fine dining, and a vast selection of accommodations and other amenities. Peek’n Peak Resort was purchased by Scott Enterprises in 2011.